Update, 3:20 p.m. EDT: Shots were fired Sunday afternoon while people marched to a church in Missouri's Ferguson to commemorate the anniversary of Michael Brown's death, Reuters reported. Police are investigating who fired, why and whether they hit anyone. Hundreds of supporters flooded Ferguson, Missouri, Sunday to mark the one-year anniversary of unarmed black teen Michael Brown's death. They congregated in the middle of Canfield Drive, the street where white Officer Darren Wilson fatally shot Brown last Aug. 9 during a confrontation. At 12:02 p.m., the group observed a 4 1/2-minute moment of silence to mark the 4 1/2 hours Brown's body spent in the road, USA Today reported. His father, Michael Brown Sr., spoke briefly about the protests that made Brown's name famous and shed light on police brutality cases across the country. He led a march Saturday in his son's honor. "You made this happen for us," Brown's dad said Sunday. Otherwise, the incident would have been "swept under the carpet," he added. Ferguson, where rioters raged for days after Brown's death and the grand jury decision not to indict Wilson, was mostly calm Sunday. Brown's friends and family built a memorial in the road with stuffed animals and flowers. A hip-hop concert and Cornel West speech were scheduled for later in the day. Nearby, police arrested a man who allegedly shot another in the arm at an anniversary-related event Saturday night, the St. Louis Post-Dispatch reported. Another incident where the back window of a police car was broken in a parking lot was determined to be unrelated. On Saturday, a group of protesters ate a roasted pig's head outside the local police station. Officers watched outside. Elsewhere, they mostly directed traffic, the Associated Press reported. Police reportedly arrested at least one Ferguson protester in New York City. "There are so many killings going on around the country. 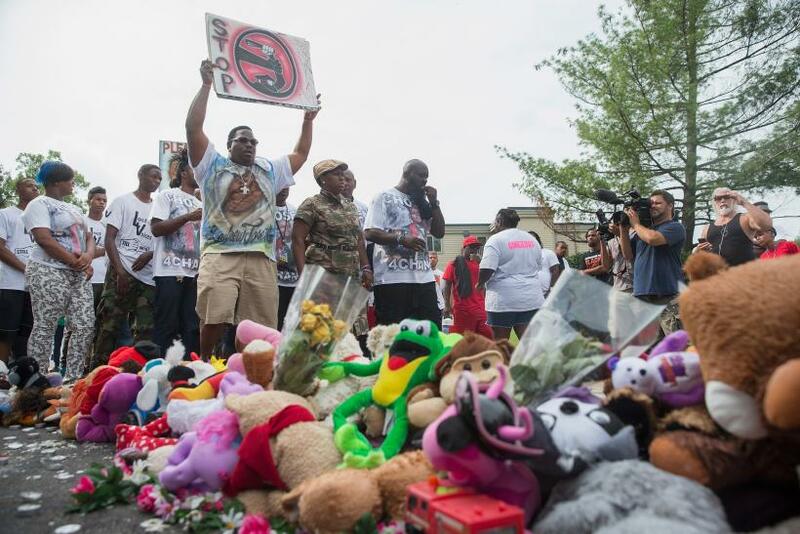 People are mad, here and everywhere," Yvette Harris, who founded the nonprofit Mothers Against Senseless Killings, told Reuters. "It will be a long time before there is a healing." Civil-Rights Movement Hits The Brakes?